This collaboration has resulted in a rising tide of deportations, replacing workplace raids as the main route used by federal authorities to forcibly remove undocumented individuals. The results are the same: families are torn apart, businesses lose employees, neighbors disappear. In addition, this new federal strategy has lead to mistrust and fear in immigrant communities towards local law enforcement, emergency services and public institutions in general. This means that if you are walking around in Arizona, you can be charged with a misdemeanor if you’re not carrying identification to prove you are a legal resident. The bill has just passed the Arizona House and could be on the governor’s desk by Friday. Please contact Gov. Brewer today and tell her not to sign the bill into law. Across the country, law enforcement agencies are developing relationships with ICE that could lead to Arizona-like laws in the future. In Oregon, people booked into county jails are asked what country they were born in. Regardless of whether they are accused of a misdemeanor such as shoplifting or a more serious crime, the way individuals answer that question could determine how long they stay in jail and whether they are sent to a detention center and deported. Clackamas county just began a program called Secure Communities which allows local law enforcement to cross-reference fingerprints of arrestees with the DHS database. This process inevitably involves racial profiling and results in perceived immigrants spending longer periods in detention regardless of their immigration status. 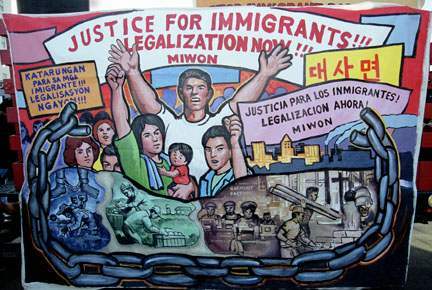 Undocumented individuals accused of minor crimes such as traffic violations are classified as “Criminal Aliens” and this label is used to spread fear in the larger community. In many cases individuals are deported without ever being convicted of a crime.